Last year I went through a very difficult period of my life, being severely ill for 9 months before I got my Primary Hyper Parathyreoidism sugery in October, which turned my life up side down to the much better, and I am now working at full time again. But I need some time to recover and get used to my new life situation and terms, and I have no rush. Anyway, it looks like my taxregistered artistically compagny is surviving this 9 months crisis, which I think not very much other self-employed people would be able to. I am now allergic to preservatives in all available wet paints on the market and experimenting myself developing new medias within wet paint would be too time occupying and risky, I think, and I also don´t feel up to the fight getting new art medias recognized in Denmark, so I have to deal with those limits in my artistically expression. Therefore, my prefered art media this year from now on will be crayons and ink on paper or cardboard, woven heart art or my photo art, which I got the Art and Science Award 2016 in Milano for. But people are also deeply IN LOVE with my unique miniature universe, both my art miniatures and my design miniatures, which are created by use of magnifying glasses and strong glasses. Last summer some people saw my drawings from some beautiful places and parks in Copenhagen, where I gathered energy to continue my fight to survive this illness, and they encouraged me to create a combined miniature art gallery and a miniature design shop in Copenhagen. I think it is a good idea, I just can´t find any place in Copenhagen to do it, ... - and I don´t want to go down on my international recognition level and exhibit in your garage in Copenhagen as somebody suggested to me, when I exhibit in palaces, castles and other beautiful places outside Denmark. Last year during my illness I was in USA given a CURRENT MASTER title for my artistically development from abstract to naturalistic, and I know that gives me some obligations. But just because I can make delicious exhibitions, I am not bound to do it anywhere, and just because I am good at setting up popular well-visited art exhibitions, and be an experience myself by entertaining people, I am not dued to do it all the time. Because if you are good at many things as I am, there is a risk that you will never have some sparetime, time-off or relax, go on vacations or inspiration trips, and I need that as much as everybody else. So I have to find a new way to be an artist, while I am moving my artistically universe from Tisvildeleje 60 kilometres to the place I am born, Frederiksberg and have to live in, Copenhagen. Maybe I´ll chose to have a break in some of my artistically activities within one or two art medias in order to focus 100% on 1 or 2 of my other activities /medias. Time will show. Meanwhile you can watch this blog´s "artwork in progress photo from last summer (2016) (Size: 10-15cm) , which you will find in a finished version under item "6: Miniatures" in the art gallery. Honestly, I don´t know for sure right now where or when my next exhibition "Med lup og blyant * With magnifying glasses and pencil" will be on show in Copenhagen, I just know that it will and that I am willing to wait for a long time for the right place to work and to create this exhibition. 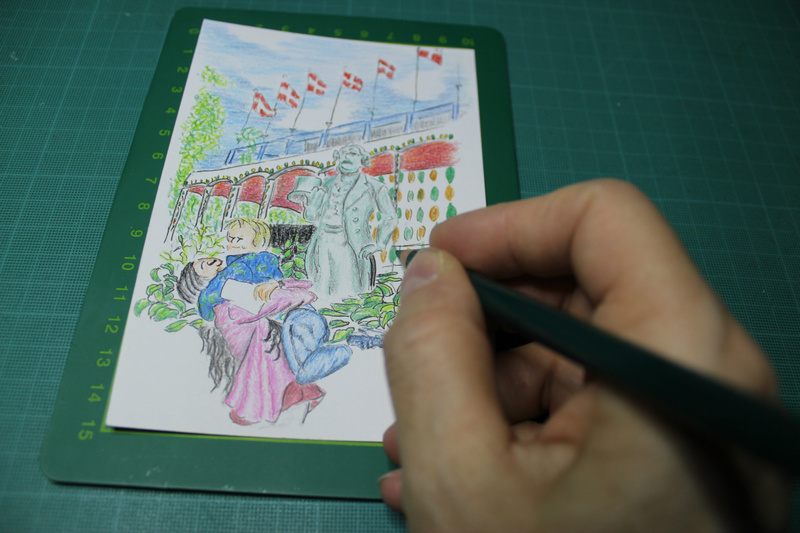 I don´t have any rush, I am just finding some of my small artworks in my moving boxes and realizing my sketches from a certain amusement park last summer in Copenhagen, which doesn´t need further introduction, I think . Artworks will speak for themselves. Illustrations always do . Otherwise they are not illustrations. Gradually, they will show up in the gallery under item "6: Miniatures." I am thinking over my life and keeping my doors open for opportunities and looking for a new little place in Copenhagen I can make even more beautiful. I also love to write. Fortunately, I still have some freelance writer jobs, too, on a confidential contract right now.